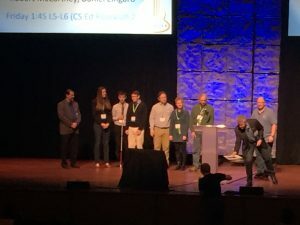 SIGCSE 2019: “Top 10” Nominee and new paper! Thank you, SIGCSE community, for recognizing Peer Instruction research’s impact on CS education by nominating the 2016 paper, “A Multi-institutional Study of Peer Instruction in Introductory Computing” for the voting to decide which papers are the Top 10 in the 50-year history of SIGCSE! We’re honored, and the work on Peer Instruction continues with a new paper being presented, “Evaluation of Peer Instruction for Cybersecurity Education.” Catch that talk on Friday 1:45-2:10 in Hyatt: Greenway D/E (2nd floor).